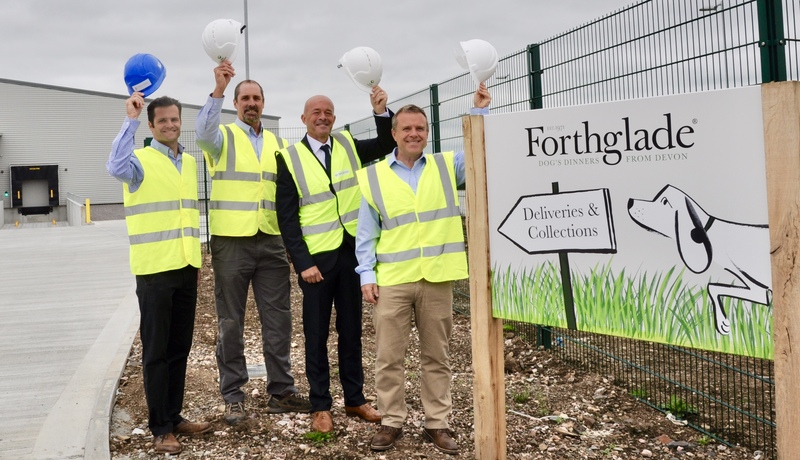 It was ‘hat’s off’ to a successful handover by Exeter-based Devon Contractors of a £5.8m new-build factory for expanding Devon-based natural pet food makers, Forthglade. First established in 1971, Forthglade now with over a 100-strong team, is relocating their manufacturing operation from their former site in Winkleigh, to the newly developed Okehampton East Business Park. Devon Contractors established in 1946, has built on its long-standing reputation for delivering high-quality buildings. They carry out minor and major works, including new-build across a range of sectors up to a value of c.£12million, working primarily across Devon, Cornwall and Somerset. With a gross floor area of c.70,000 sqft., including a manufacturing facility, spacious warehouse and modern offices, the Forthglade scheme took 11 months to build. The project consisted of an extensive cut and fill exercise to fit the building and external works onto the existing sloping site. The building is a steel-clad propped portal frame with two-storey office area to one end, factory production and warehousing - including mezzanine storage - with a lean-to ancillary section to the side for plant room, boiler room and maintenance. Externally there is a large area for planting, a service yard and visitor / staff car park along with access road. Fencing and soft landscaping with wild flowers will complete the embankments areas. The Forthglade project was headed up by Devon Contractor’s Project Manager Jason Willicombe. Gerard Lovell, Joint MD of Forthglade, said: “It’s been incredible to watch the new factory taking shape over the last 14 months. We’re grateful to both Devon Contractors and also the support received from Devon County Council throughout the project’s development. This is an extremely exciting time for the progression of the Forthglade business which has been manufacturing in Devon since 1971. Everyone at Forthglade is really looking forward to officially opening the factory in a few months’ time”.